Earlier this week we ran our first Barts MS Group Clinic. This is something that we’ve been working on for a few months, and has been something that Prof G has wanted to do for a while. Group clinics have been proven to work in other health areas and we want to think about how it can improve our service at The Royal London Hospital. Like all of our patient engagement projects, the Barts MS Advisory Group were key in helping us develop the format and content for the session. At the start of April the group met with the clinical team to help them focus on exactly they wanted to achieve through the group clinic format (Image below of the clinic plan). 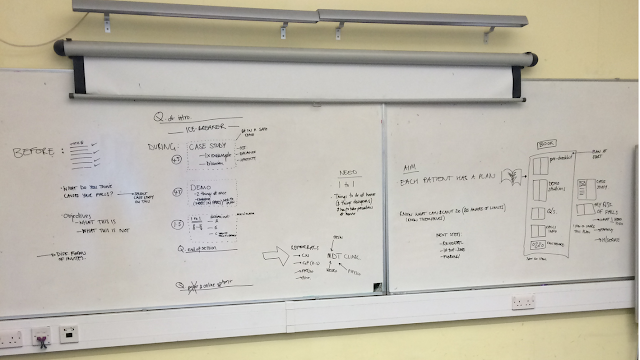 Then in June the Advisory Group and the clinical team went through a full rehearsal of the clinic to ensure that the patient experience would be informative, effective and enjoyable. 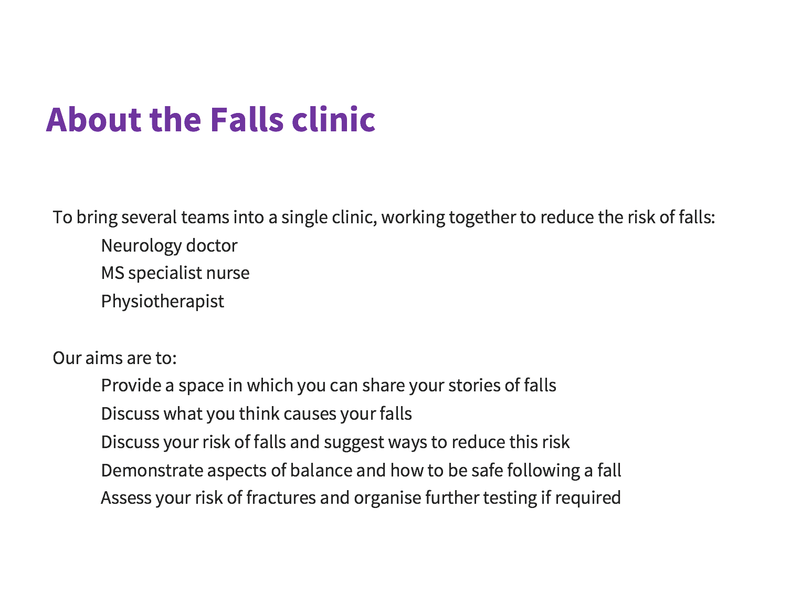 “The advisory group met on 21st June for a first run through regarding the proposed MS Falls Clinic, a clinic designed to minimise the number of falls that pwMS regularly experience. As detailed previously, this is exactly what the user group is for, working with clinicians to ensure our voices are heard and our ideas taken forward. As I think we all expected it was a lively session with 4 pwMS and 6 or so clinicians, each with a different background and skill set, all working together to make it relevant for pwMS. The clinic involves practical exercises, case studies and 10 minute one-to-ones with the clinical team. To help with some of the behavioural changes that we’re trying to promote through attending the clinic to reduce falls, we are testing using a Google+ page to support further conversations that start in the clinic. This is an open site that we hope can host fall specific information. We are delighted to be involving the MS Trust in helping us keep this page updated with the latest in Falls advice and research. At the moment we have a funding application that if successful, means we can run a further 8 group clinics over the next 10 months for falls, bladder and lifestyle issues. This is such a fantastic concept and in many respects also applicable outside MS. I can perhaps be a bit helpful. Back 30 years ago my fiance' (Rick) worked in the local school system as a sort of jack of all trades, plumbing, heating, electrical, locksmith on and on. He was trained in a variety of hazards from chemical to electrical etc etc including walking hazards within the schools. Over time it just became all habit to him. He's tried teach me to some success. When walking most people do more forward (distance) gaze than they do directly in front of them. He was trained in that the immediate 16-20 feet directly in front becomes focal point at 30 – 45 degree angles. The head always bent slightly downwards. Then as area is covered eyeballs up and scan distant. Pretty much opposite of what most folks do. He was taught that not only does this make for safer walking but also enhanced close peripheral vision and acuity of it towards movement (which his is just unreal accurate and broad). He was taught never ever if at all possible carry anything that obstructs. If for example a person is carrying a box its important to make sure it does not obstruct vision or least amount thereof. That might mean carrying it in a bag. How to know "steps". To him, all natural now. Some steps have a lip, some not which the front of a shoe can catch. Walking down stairs to make sure each foot opposes at a slight angle creating a small triangle towards balance. If carrying weight down stairs to move the ball of the foot backwards as one steps down until it or the ankle feels resistance as it strikes the step striker or if none exists (as it say a wooden deck) the lip of the step. One hand for balance, one for a railing. That railings always need anchorage capable of holding full weight + 100 lbs and preferable on both sides of stairs. Shoe tread, very important and different from summer to winter both in pattern and hardness. This is particularly important when going into stores, hospitals etc. The high traffic institutions tend to use floor finishes that are called "high in solids". Essentially they are a hard floor finish. It allows them to endure high traffic without wearing away and as buffed will bring back the shine. The problem is that also are much more slippery than low solids and MUCH more difficult to see water on if the floor's are bright or very dark in color. The angled forward eye scan can detect this condition by slight side to side vision. Eyeball position does not need to change. But focal point scans right to left and left to right slightly. The water edging will appear as light strikes it and reflects to the eye. Cloth shoe booties also exist that have a tread bottom. They tread is soft rubber. They go over the shoe or boot and afford excellent grip on finished floors. He just told me they had to do balance training as well. Offset weighting. Hands, feet, legs and combinations thereof. They had to do it as it helped with stairs and ladders where one might need carry weight. He says they were also trained if falling how to fall. He says, "Most injury caused by falls is in the attempt to recover from the fall in progress .vs. trying to control the impact." He continues, "People often try stop the fall in progress using their hands or legs putting them into positions that when impact occurs can result in injury to the limbs. They were trained in a fall to protect the head bringing hands up palms over the ears and fingers around back of head clenched, elbows inward across the chest. Legs to be tightened and preferably drawn inwards or outwards depending on the fall type (forward or backward fall). He said they trained on these thick foam Gym mats and a spotter sometimes two help simulate the fall. Then they'd train on it. He also said the school district had a different arm and waist bands for stairs and ladders. Not sure if those are industrial usage only he says. But he said one that would be good for disability had a strap go around the wrist and part of the forearm about 6" long and was held by velcro. Then in the hand was a clasp that would slide along the railing. The clasp is spring loaded and the moment one's hand came off the device as it was slid down the railing it'd activate grabbing the railing. Says it saved him from stair tumbles a few times and said there are some other ones that are not spring loaded that instead they grasp based on angle. As one falls and is holding the railing as the angle comes unto them of the fall they grasp. He said they used to call them shackles between the guys as the side that slid down the railing looked a whole lot like a wrist shackle. This is all stuff we'd like cover as well at MS Unites. I'm not Anon. See End 🙂 This is a great concept. I don't fall, but I am bruised constantly due to running into random walls and such. Unfortunately, being in the US, I won't have access to this wonderful resource. I wonder if it would be possible to record a session without disclosing patient specific information to reach a wider audience? If so, why not use the platform to possibly license the media content to US clinics or interested parties who "do not have/make" time for such great collective patient care"? Could be an excellent way to fund research projects/initiatives that this forum provides that we all love so much? I don't know the legalities being from a different healthcare marketplace, but I do know for one it would be well received if published either way. The US marketplace is 110% for profit (and then some)…even those that claim otherwise (they just use the excess $$ to build bigger buildings and buy more advertising space). I know this because I am an industry insider. I break down healthcare cost by the diagnosis and by the provider for fun. Seriously. Well and for $. Because $ is fun too! Don't get me wrong, I am all about free, but we all know nothing is free, not even healthcare (or running this site *Time is Money*Wink Prof.G). If hospital's, clinics, or other groups want to provide this service I think they would be willing to pay a small licensing fee. 🙂 I know this is contrary to the mission of this site, but being the entrepreneur that I am, we could all benefit from a little $$ heading your way!! And we all know, there is no incentive for anyone in the US to make something like this happen because the professionals won't get paid, none of them can agree on anything, their office visit numbers might go down with a better educated population, and can I say it again…..they WON'T GET PAID? Sorry for the sarcasm, kinda, but it's the truth from an American perspective. And I would really like to avoid another $50 office visit copay to discuss my bruising problem. Hmmmmm…..maybe some rich guy/pharma will donate the video production and marketing efforts…….they seem to have enough $$ to be on my TV every 10 minutes. Biogen, if your reading, I'm just sayin! hint. My apologies to any US MD's I might upset with my post/rant! Pharma, well, not sorry. You CAN do better. Keep doing what your doing BartsMS! ClinicSpeak & PoliticalSpeak: should internet access be a basic human right?